Baby Led Weaning: a new concept to me. At least new in the sense that I never realized it was an entire philosophy of introducing baby to solid foods. And I am thoroughly intrigued! The topic of BLW has come up in a few discussions lately and after some great conversation with my hubby about it, we would really like to try it with our little one when she starts eating solids. In essence, BLW is the concept that instead of weaning babies from breast milk to "mush" (aka: purees, baby food, baby rice), they transition straight to real foods (obviously appropriate to their age and ability). The idea is that when baby begins reaching for foods, they are ready to start self-feeding. And from everything I've been reading, the many advantages include earlier development of hand-eye coordination, a better developed pincher grip and babies who are more willing to explore all types of foods. No mush necessary! Of course, I am now asking all of my mom friends about it and would love any advice or opinions on the subject! And once I finish up some of the required books for our Bradley class, my next read will be Baby-Led Weaning, so I can get a better grasp on the idea. Thankfully, I've got some time! What do you think? 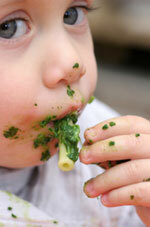 Ever heard of Baby Led Weaning? Love the idea or hate it? I would love to hear!